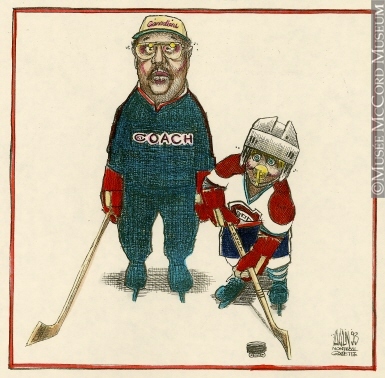 Coach and Midget Canadien Hockey Player, by Aislin, a.k.a. Terry Mosher, 1993, from Montreal’s McCord Museum. Georges Laraque says that Wayne Gretzky is the worst coach he ever played for. That’s the news this week from Georges Laraque: The Story of the NHL’s Unlikeliest Tough Guy (Viking Canada), that and a whole bunch of stuff about the prevalence of steroids and assorted other performance-enhancers in the NHL. That’s what first caught the headlines before giving way to Gretzky’s terrible coaching. For the background on Gretzky’s career behind the bench — how he got there, why he loved it, what boded so well — Roy MacGregor has helpfully included his admiring 2005 profile “Coach Gretzky” in Wayne Gretzky’s Ghost (Random House). Laraque is not so fond. “He could hardly have been worse,” he writes, with Pierre Thibeault’s aid. Coach #99 had no strategy. He never yelled at his players, only at referees. For a forward line, sometimes, he’d send out the three players sitting closest to the door, even if there was no centre among them. On the road he missed practice. “It was frankly ridiculous,” Laraque says. At least he waited a few years. In 1971, fifth game of the Stanley Cup finals against Chicago, Montreal coach Al McNeil benched Henri Richard. “Incompetent,” Richard told reporters after the Canadiens lost that night. “He’s the worst coach I ever played for in my whole career.” Two games later, Richard scored the goals that tied and won the seventh game and the Cup for the Canadiens. Afterwards, just before the team sang “Les Canadiens Son Là,” McNeil and Richard hugged at centre ice. Didn’t matter. “I think I was right then,” Richard said a month later, “and I still think I am right.” McNeil had already been replaced by Scotty Bowman. 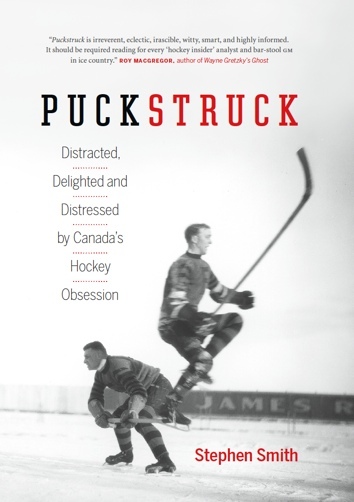 In Gretzky’s case, it was his friend Darren Pang, the broadcaster and former goalie, who took up the defence. First he took to Twitter to harangue Laraque: “How would he know? 1st guy out of rink…#wheresgeorge?” On Tuesday, Pang was on TSN to refine his response. “My feeling — and I said this to Georges as well — is why would you go out there and say something like that when a man treated everybody with such respect? A little hard on men like Reay and Tommy Ivan and Rudy Pilous? Maybe, but at the same time, you have to give Hull credit for a remarkable self-awareness. When he jumped, after all, from Chicago to Winnipeg in 1972, he signed on not only as the Jets’ million-dollar marquee left winger, but as head coach as well.